UPDATE: You can find a new post with 100+ Easter Basket Stuffers & Catholic Gift Ideas here. Over the weekend, I planned out our children's Easter Baskets for this year. While I was at it, I decided to share the following list of ideas - some for this year and others that we have used in the past - tying in our beautiful Catholic faith and the true meaning of Easter. Just like on the feast of St. Nicholas, when we give our children each an Advent/Christmas themed book, we have always given our children a new book on Easter. Over the years we have built a wonderful collection of Picture Books for Easter! Also, now that my boys are getting a little older (and since the UPS man didn't arrive until 8pm on Rascal's Birthday) I decided to give them each a new chapter books, Lost in Peter's Tomb and Break-In at the Basilica . This looks like such a great series, and I am excited to give them to the boys.
.: Coloring Books and/or Art Supplies :. The Holy Imitation Series :: Life of Jesus , Mother of God , Holy Name of Jesus, Eucharistic Adoration, and The Rosary . Catholic Story Coloring Books :: All these coloring books include beautiful stories by Mary Fabyan Windeatt. Catholic Mosaic Coloring Book :: I am sure most of you already own a copy of Fenestrae Fidei: A Coloring Companion for Catholic Mosaic, but if not, you really should consider adding it to your collection. I love that the illustrator and publisher gives permission for copies to be made for family use! Art Supplies :: I have been slowly adding to our supply of quality art supplies. The Stockmar Modeling Beeswax that I purchased for the Alphabet Path was expensive, but it has inspired so much creativity in our children! They still use it on a weekly basis. This year I ordered a cute little set of Crayon Rocks in a Cotton Muslin Bag for Snuggles. I think he is going to love them!
. : Catholic and/or Easter Stickers :. Trademark Stationary :: These traditional and inspiring stickers are my favorite! RosaryCard.Net :: Here you will also find a great assortment of Catholic Stickers, in addition to free shipping! Autom :: Although you have to puchase these in bulk, Autom has a great variety to choose from. Including all the stickers that can also be found (occasionally) at the Dollar Store. It wouldn't be hard to find a few friends to split an order with! Amazon :: I love so many of the little Dover Sticker Book, and so do my children. I ordered a number of the religious themed sticker books to put in this year's Easter Baskets including Angels in Art , Shiny Crosses , Celtic Crosses , and Littlest Angel Stickers . All of these qualify for Amazon's 4-for-3 promotion! I also ordered (and LOVE) some of the old-fashioned Easter Stickers including Old-Time Bunny Rabbit Stickers, Glitter Old-Time Easter Stickers, Old-Time Easter Stickers, and Old-Time Easter Animals Stickers. We don't generally put a whole lot of candy in our children's Easter Baskets - they usually end up with plenty from their Easter Egg Hunt. I do like putting in a Chocolate Cross each year and sometimes (when I can find them) the little Lindt Chocolate Lambs. This year I am planning on making my own candy to include in the baskets. 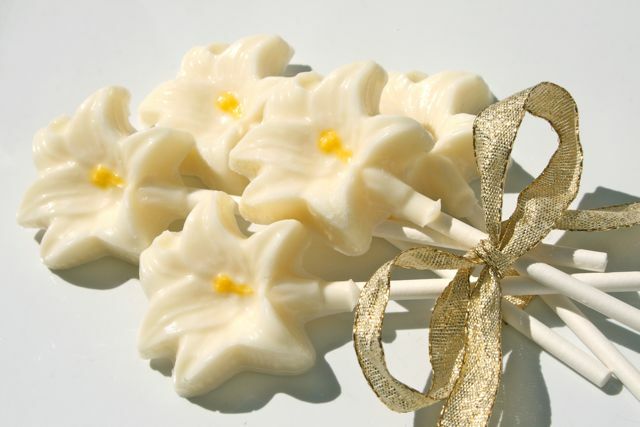 I already have the mold to make Easter Lily Lollipops and I also decided to order a larger cross mold (I currently only have this small cross and bible molds ). Amazon has quite a few Cross Candy Molds to choose from, but I ended up choosing this one and this one . I am also thinking about ordering a lamb mold as well, although the nativity mold I already have would work just fine, if I am not able to find the Lindt Lambs this year. To tie in each of my Children's Patron Saints, I have decided to include a Hand-Painted Wooden Saint for each of them. Inspired, back in 2008, by the Wee Felt Saints used in the Alphabet Path, I decided to paint our own Alphabet of Saints. 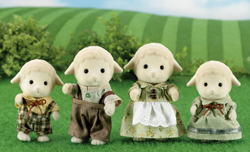 My children just love these little dolls and really enjoy playing with them! Along the way I have added a few others to our collection and this past year I painted a couple larger saints for Rose's first birthday. I have purchased/been given a few saints that I will put in the baskets this year, in addition to painting a couple more myself. I have found Woodworks LTD to be a great place to purchase the little wood people and wooden toy parts. 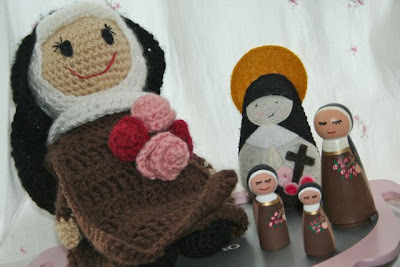 I am often asked whether or not I would be willing to sell any of my little saints. You all are so sweet, but, to be honest, I think you'd be much happier with the darling dolls from Catholic Folk Toys, St. Luke's Brush, or St. Anne's Pixies - these (real) artists are able to add so much lovely detail to their dolls, unlike myself. If I ever find the time to paint some (very plain and simple) extras, I will let you know! Another option would be to make your children darling Saint Dolls using Amy's Crochet Saint Patterns or Charlotte's Saints 'N Stiches. Or you could always order the cute little Saint Softies from Saintly Silver.
.: Religious Medals, Scapulars and Rosaries :. Often I will tuck in a new medal, rosary, or scapular into a little easter egg. I've been noticing that all of my children's scaplars have pretty much fallen apart this past year, so we will be including a new brown scapular in each of their baskets.
.: Holy Cards and Games :. Various Holy Cards, Holy Traders , Vessels & Vestments, and other Small Catholic games would be great additions to Easter Baskets. I am thinking of making each a couple new card games for my children, like our Saint Joseph Memory Match Playing Cards. I hope you are all having a blessed and fruitful Lent! Thank you for this list! I have been trying to find the Stations of the Cross and Rosary stickers at my Dollar Tree without any luck, and am so happy to hear that I can purchase them online. Oh thank you Jessica!! This is great! Easter is sneaking up on us fast, isn't it? Yikes! There are so many fantastic links here I don't know where to start. THANK YOU! Which size peg dolls did you get for your Alphabet of Saints? My mother-in-law is an artist by trade, and if you don't mind, I think I'm going to have her make a set just like yours for us, including the kids' patron Saints. I LOVE this idea and was just telling my mom about doing the same sort of thing for my kiddos for Easter! I love those ideas- thank´s for sharing! God bless from Germany, Nicole. Great ideas!! Thanks for sharing all the links, too! Sarah ~ The majority of our dolls (including the Alphabet of Saints) are all made with the 2 3/8" Doll. I've used the larger 3 1/2" Doll for the ones I painted for my littlest one. Hope that helps! Sarah ~ I actually checked Target this past weekend - that is where I usually purchase them - and ours didn't have them. :( I will have to check again. . . Maybe they were just out of stock and they will get more in. Thank you for all of the wonderful ideas!! You are very creative and have really helped our family bring the liturgical year into our home. I found it fun to know your family is linked to the Fraternity of St. Peter too. My brother is a Fraternity priest. God bless and blessed Lent. Thank you so much for a wonderful post! I love your ideas and am now thinking, maybe I'll try my own hand at making the children's chocolate treats with molds. I love your blog!! What are you using for the candy molds? Do the Wilton Candy Melts come out shiny like that or are you using something else? I really love the lily mold and think that would be fun to make for Easter. These are great ideas! I looked at our Catholic bookstore for ideas last year and unfortunately didn't have much luck! Angela ~ It looks like I somehow missed answering your question. . . Yes, I am just using the Wilton Candy Melts. They work beautifully as long as they are fresh, and if you don't over heat the candy when melting it! What great ideas, while I have no problem figuring out St. Nicholas Day and Christmas gifts I am at a loss to pick out Easter Basket items. I don't want a basket filled with candy and dollar store toys. I want gifts that are meaningful and faith filled. Now I wish I had read this post before i bought the fillings for the baskets. Hi Barb, I somehow missed answering your question... We don't decorate our home for Easter until late on Holy Saturday. We do decorate with lots of purple and all of our Lenten "decorations" from Holy Week through Good Friday, and then I usually replace them with the Easter decorations after my kids go to bed on Holy Saturday, leaving it out until Pentecost Sunday.